On the heels of the HR Tech Conference, it’s fun to finally see start-ups in the recruitment space again. The Great Recession had put most of the ideas (and money) on hold. It’s essentially a people search engine where recruiters can source candidates from a wide variety of destination sites and networks. The usual suspects are included, such as LinkedIn, but the service also indexes niche properties, usually focused on tech, like GitHub or Stack Overflow. 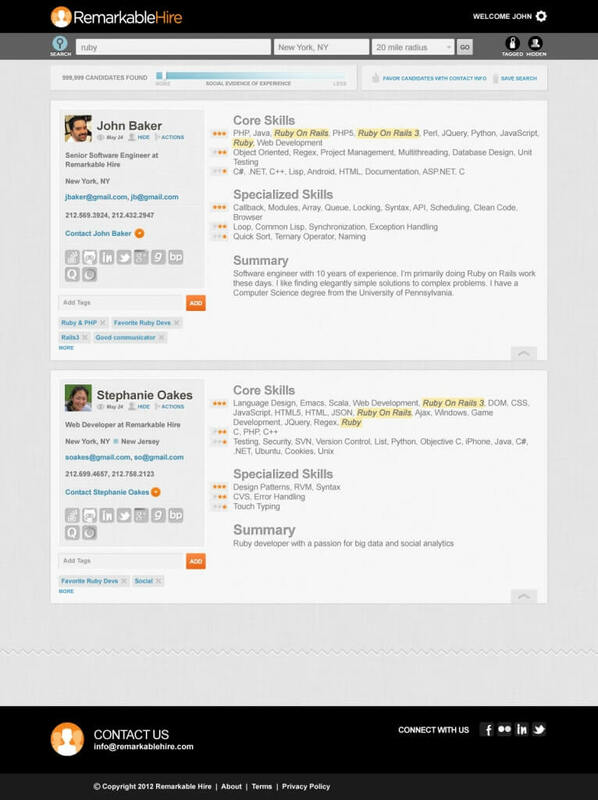 RemarkableHire attempts to rank candidates’ skills based on their social activity. So, someone really active on a Ruby on Rails network might rank highly for “Ruby” in your search results. The other point of interest for me was who they count as an advisor: Susan Strayer LaMotte. Many in the recruiting space know Susan – who currently heads-up a consultancy called Exaqueo – but if you don’t, she’s been around the block a few times and has a solid reputation. So, her endorsement means something and should open doors with employers. I recently set-up a video interview with Susan and co-founder Jamey Jeff to learn more. As you’ll see in the interview, the company is bootstrapped, having taken zero in investment as of today. But they are open to it in the future. Pricing for their service is $349.99/mo. or $3,599.88 annually ($299.99/mo.). As companies continue to move away from job distribution solutions in favor of sourcing tools like RemarkableHire, the competition is bound to heat-up in the coming year. Similar to social, video, matching and mobile, this is one trend to watch.